2" x 1 1/2" from outside edge to outside edge of the gold frame with master's work one. The Gleaners (Des glaneuses) is an oil painting by Jean-François Millet completed in 1857. 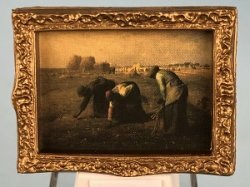 It depicts three peasant women gleaning a field of stray stalks of wheat after the harvest. The painting is famous for featuring in a sympathetic way what were then the lowest ranks of rural society; this was received poorly by the French upper classes.